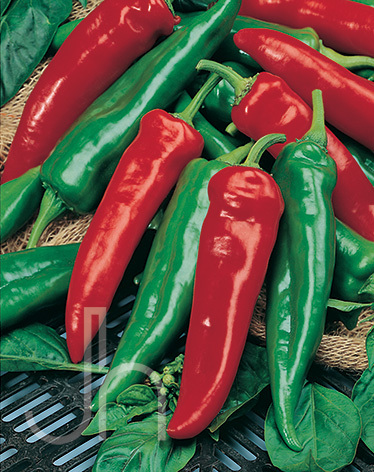 Anaheim peppers are long, narrow, light to medium green peppers that turn bright red when left to fully mature. As peppers are of tropical origin, plants thrive best when temperatures are warm. Being sensitive to the cold, planting should be delayed until the danger of frost is past in the spring. Ideal temperatures are 70 to 80 degrees F during the day, and 60 to 70 degrees F at night. Usually, the plants set satisfactory crops when temperatures are between 65 and 80 degrees F and the soil is well-supplied with moisture. Avoid a soggy, water-logged soil condition when growing peppers. Outstanding Features: Anaheim Peppers are used in many dishes for a mild chili flavor. Anaheim is what you see dried and hung on strings and canned, roasted and peeled in grocery stores. Click here to buy Anaheim Peppers direct from www.buygardenvegetables.com.